Justin's WeatherTalk: Warm Wet Weekend. Christmas Snow? This morning's national radar seen here (3am to 5am) is a little bit of job security. No, I will never claim perfection-nor should any forecaster. Yet I did beat the computers on this one. Yesterday I mentioned the prospect of this southern storm being a little closer to us, and worth mentioning. This morning, while the surface low was chugging through GA and SC, the shield of rain was on our doorstep. While it was just patchy drizzle and flurries here, it helped to moisten up the atmosphere and set the stage for more today. Combine the east wind, and more drizzle and fog will form throughout the day, in fact into the weekend. Not 100% on my end, but I did mention the chance yesterday, while there was no support from NWS or the mid range models. As for this weekend, I am sticking with the Canadian here, which show a chance of getting over 1 inch of rain. Here you can see the 500mb level (on the right) energy I marked with an X. That is the support for a second area of low pressure to form along the front to enhance the rain. That's a good soaker on a holiday weekend! The push of warm air will continue all day Sunday, so my forecast of 54F may actually occur at night. Here again is the Canadian 500mb (roughly 18,000Ft) map. I've highlighted the troughs with an X to show the energy that will keep us active for the end of 2007. The one over Maryland is the support for flurries or light snow. It looked a little more yesterday on the surface prog maps, but there still is hope for the flakes. 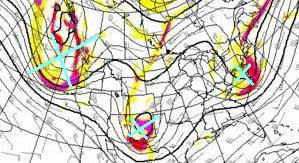 The system in New Mexico will reach us with rain or snow by next Friday. The Pacific NW trough will likely affect us after that, but the traditional La Nina pattern with storms riding the Great Lakes and giving us rain, is likely to continue for the next 2-3 weeks.